Your feelings about autism are constructed by living in a world that fears and stigmatizes disabled lives. Your distress about an autism diagnosis are most certainly because of these unhealthy messages. Please remember that your behavior in regards to your child’s diagnosis is a choice. Signing this behavior plan means that you will always put the dignity, autonomy, and love for your child above buying into the dominant narrative of tragedy or the belief that autism is something that the Autistic person is doing to you. We are sitting in circle today (a restorative justice process we use to communicate), and the question now hangs between us, fourteen kids staring at me, waiting for an answer. I know what she is asking me; has this year, with this group of kids, made me write less or more? Has this year been too tough to handle or have I found inspiration? What will I tell others about the kids I teach? I don’t hesitate, I tell her the truth, after all; these kids tell me their truth all of the time. We know we set the mood of our classrooms. We know that the power we have to make a day better or worse is immense. We know that what we think about a kid, or a class, sometimes matters more than what we actually do. After all, kids can read us in ways we have yet to fathom. So when I had gotten stuck on a class being negative. When I had formed a narrative in my mind that a class was never excited to come to English. When I had decided that this was my least engaged class, I was right. Because the moment I decided it, it became true. Kids will gladly live up to what we believe they are. And every day I would think of ways I could get the kids to change. When I moved to 7th grade English, I didn’t know how much this change would affect me. How I would spend more hours than I had ever spent trying to help all of my students like reading more. How their reading truths would shape me as a teacher. How there would be lost sleep, but also triumphant moments of knowing that what we did together made a difference to a kid. That what we did together meant that a child might actually keep reading or even start back up. I have shared our experiences here. I have spoken about it wherever I have been invited. I have taken the words of my students and held them up for others to learn from because they have taught me so much. Through their insight, I was able to become a better teacher, even if I still don’t have all of the answers. For International Women’s Day, she shares her journey and talks about why we need to start recognising and supporting autistic women and girls. 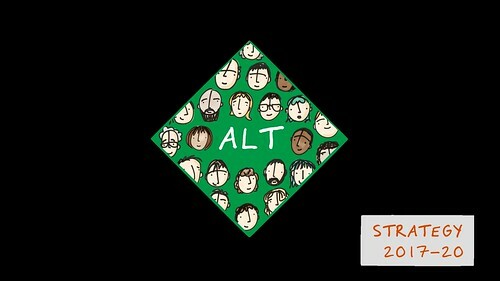 Never mind the UK Government’s UK government digital strategy, the most important strategy launch this week is the ALT 2017 – 2020 Strategy.